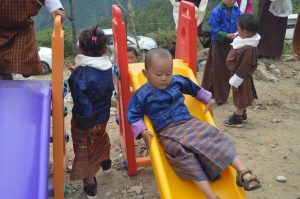 His Excellency the Sherig Lyonpo Norbu Wangchuk has inaugurated the Loden’s 5th Early Child Care Development (ECCD) Centre in Dawakha in Paro this morning. The centre was established in partnership with the Ministry of Education and the Dawakha Community. With the financial assistance form UNICEF, Loden built the physical infrastructure, which is fully equipped with necessary educational materials. 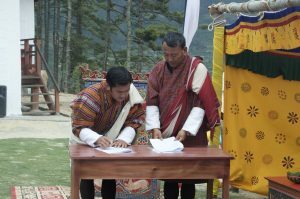 The local community contributed a space for construction and the Royal Government of Bhutan has provided two trained facilitators. The project is thus an outcome of tri-party partnership between the government, non-government and the local community. 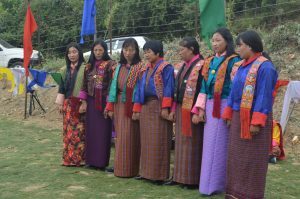 With aims to combine to modern ECCD techniques with traditional Bhutanese upbringing, Loden opened its first Centre in Ura, Bumthang in 2008 followed by other Centres in Samtse, Mongar and Zhemgang. 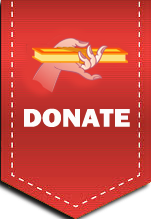 A total of over 500 children have graduated successfully from Loden ECCD Centres since 2008 until the end of 2016. His Excellency the Sherig Lyonpo also offered Tashi Khader to the facilitators and children enrolled in the Centre. Dasho Dzongda of Paro, DEO, officials from the Ministry of Education, Representatives from Dogar Gewog, officials from Loden and members of the local community took part in the event.